Lab Chimps Rescued a Second Time – FIREPAW, Inc.
Click here to watch video of these chimps! The future was looking uncertain for a group of more than 60 chimpanzees that formerly served as laboratory research subjects for the New York Blood Center (NYBC) in Liberia — until the Humane Society of the United States (HSUS) recently stepped in to take over their care. 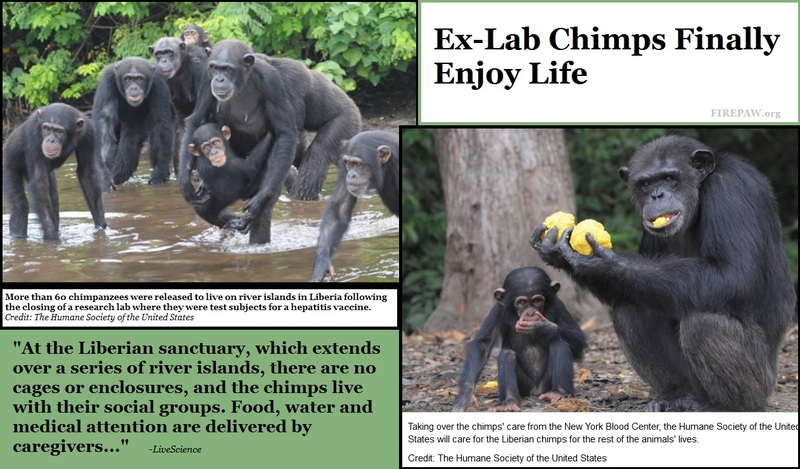 The chimps, which were raised in captivity and could not be released into habitats with wild chimpanzees, had been placed in a Liberian island sanctuary more than 10 years ago, after the NYBC ended the local research program that used the chimps to test a hepatitis B vaccine, in 2004. But the NYBC struggled to determine who would ultimately be responsible for the primates in the long term. And years later, time and money were running short.